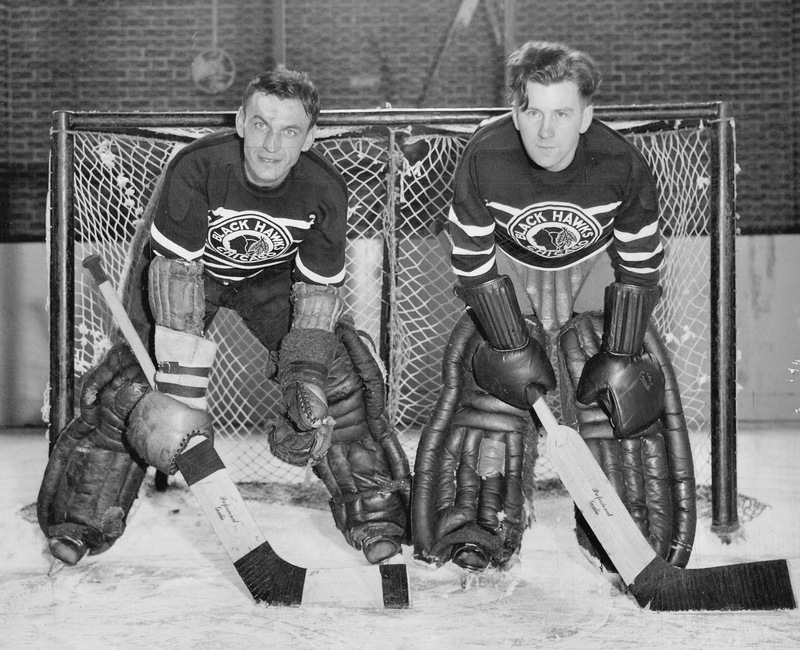 Dual Purpose: Mike Karakas (left) and Paul Goodman share a Chicago net in October of 1938. Note the script on their sticks: “Professional Goalie.” And if you zoom in on Goodman’s left mitt, you’ll see it’s inscribed with the name “Alex Connell.” Did Goodman borrow the leather, perhaps, from the august Ottawa goaler, whose career had come to an end in 1937, or maybe did he inherit it? Could be an autograph, I guess, or an invocation, Goodman’s reminder to himself of who he wanted to be emulating when the pucks started to fly. Chicago Black Hawks goaltender Mike Karakas fractured a toe on the eve of the 1938 Stanley Cup finals, and for a while there that April it looked liked the Hawks would open the championship series against the hometown Toronto Maple Leafs with New York Rangers’ borrowed backstop Dave Kerr fighting their corner. There was a whole kerfuffle over that, featuring fistfights among coaches. As it ended up, the man featuring in the Black Hawks net was Alfie Moore, who’d played a little previously for the New York Americans, and happened to be on hand. In search of a more permanent solution, Chicago also rushed out and bought Paul Goodman from the AHA Wichita Skyhawks, though when the 33-year-old Moore helped Chicago beat the Leafs by a score of 3-1, they thought maybe he’d do fine. But the NHL wouldn’t let them keep Moore, so it was Goodman — also 33, born in Selkirk, Manitoba — who got the start in game two. The Leafs roared back with a 5-1 win, which can’t have done much for Goodman’s confidence, let alone Chicago’s. Karakas, 26, was back in for games three and four, sporting a customized shoe and toe-splint, and Chicago won both those games, which won them the Cup. Initially, Chicago’s patchwork goaling trio all had their names engraved on the Cup with the rest of their teammates. They stayed there for 20 years, until the Cup was redesigned 1957, at which point five Hawk players whose names should, by rights, be etched into hockey history (including Moore’s and Goodman’s), were, by wrongs, left off. Moore, who died in 1979, remembered things a little differently. He was at home in Toronto that April afternoon in 1938, he recalled — and sober. The Leafs called, collected him, took him to the Gardens. “I didn’t know what they wanted,” he told Larry Spears in 1965. It was only when he got to Chicago’s dressing room that he learned he’d be suiting up to play for the Stanley Cup. They changed their minds, later, of course. “I wouldn’t say that it was my best game, by any means,” Moore said subsequently. “It was just the circumstances of it, a minor league goalie, the Stanley Cup, and all of that.” He was duly fêted when he travelled to Chicago to see the Black Hawks finish the job he’d started. Paid $300 for his game-one troubles, he later got a gold watch from his fleeting Hawks teammates, while the club contributed a week’s holiday at their expense. Paul Goodman was back with the Hawks in the fall of ’38; the photograph here dates to that pre-seasonal October. Toe-healthy, Karakas wasn’t quite ready yet to cede the goal on anything like a full-time basis, and so Goodman returned to Wichita for the duration of the 1938-39 season. The year after that, Chicago had three goaltenders at camp, adding a young Frank McCool to the mix. He eventually returned to university in Spokane, while Goodman was assigned to the IAHL Providence Reds; Karakas kept his net. But only for a month or so: with the Black Hawks faltering in December, coach Paul Thompson decided a switch was in order. So Goodman finished the season as Chicago’s first-choice puck-parryist. Karakas played a bit for Providence before he decided he didn’t want to be in the minors. 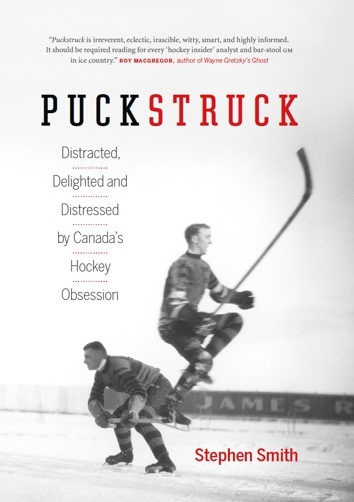 Suspended, he, too, ended up as an emergency replacement before the season was out, appearing for the Montreal Canadiens in stead of the injured Wilf Cude and Claude Bourque. Karakas did eventually make it back to the Black Hawks’ crease, but it took a while: he had two more seasons in the minors ahead of him before he made his return. Paul Goodman would keep Chicago’s 1940-41 net, but only temporarily. He got hurt not long after Christmas, and the Hawks called up 23-year-old Sam LoPresti — a son, like Karakas, of Eveleth, Minnesota. About to turn 36, Goodman decided he’d had enough, announcing his retirement before January was over.